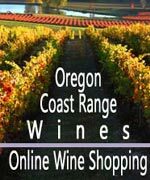 (Oregon Coast) – If you don't like that sensation of your mind being blown and your jaw constantly falling to the floor in awe, then these famed spots along the Oregon coast are not for you. If stunning beauty bothers you, then look away and stop reading. (Above: Neahkanie Overlooks near Manzanita). These sensations – and more – are what you'll find plenty of at three of the Oregon coast's most amazing viewpoints. Two are fairly famous, but one you likely don't even know exists. See the links for even more about these spots. Cape Lookout, near Oceanside. There’s actually three different hiking trails on this enormous headland, and tons of incredible views along all of them. But the main one - which winds around some five miles - is legendary for its vistas. The view pictured here is of Sand Lake Recreation Area, which is known as the "other Sand Dunes on the Oregon Coast," and the stretch of sand running between there and the base of Cape Lookout. There are many such views along this route, but this spot - hidden behind a thick wall of bushes - is nothing short of breathtaking. It's about a quarter mile down the main route. Neahkahnie Overlooks. As you drive above Manzanita, on the curvy, lofty part of Highway 101 that stands hundreds of feet above the surf and yet a few hundred feet below the tip of Neahkahnie Mountain, you will be awed. One after the other, these rather famous pullouts pop into existence as you round the turns towards Manzanita - all with rather charming little basalt rock walls surrounding them. Along one of the pullouts, a pyramid-like rock is one of the more recognizable features of the Manzanita area – and one of the more often photographed structures on the coast. It’s even briefly featured in some commercials on TV. On clear days you can see some 40 miles south, all the way to Oceanside. As you stand above all this wondrous spectacle, you don’t need big storm systems to make some massive waves below. It's true that wintertime is a perfect time to catch these monsters of the surface plodding in towards the beach. It doesn’t have to be uncomfortably windy on the viewpoints to see these. There are times when mammoth, mesmerizing waves are found even in calmer weather. 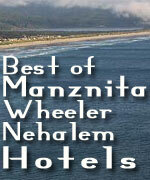 Manzanita, Wheeler Virtual Tour. Otter Crest Loop. As you drive southward from Depoe Bay on Highway 101, just a couple miles outside of town you'll notice the road suddenly rise. But if you're not careful, you'll miss the tiny, nondescript road jutting off towards the ocean right where the elevation rise begins. This is Otter Crest Loop Road – and to pass it by would be a grave mistake. It all begins at Rodea Point, and then takes you to some of the most breathtaking views along the entire Oregon coast. Yet it's quite a secret. The tiny road meanders below 101 and abruptly becomes a one way route going south. Eventually it dumps you out onto the top of Cape Foulweather, but along the way it's a gorgeous, canopied and slow drive that hovers above beautiful, rather clandestine cliffs. Sheer drops and soaring, green-covered hills dot the landscape and seascape, as the forest periodically opens up to reveal places that constantly cause you to pull over and take a few pics. Among the attractions is the Ben Jones Bridge viewpoint right next to the bridge – just before it turns into a one way. Another is a remarkable hidden spot that allows you to descend a densely forested trail and out onto one of those mysterious clifftops you see from above. You'll find the entrance at the gravel pullout just before the road turns one way. Depoe Bay Virtual Tour.